Megamodels may be difficult to understand because they reside at a high level of abstraction and they are graph-like structures that do not immediately provide means of order and decomposition as needed for successive examination and comprehension. To improve megamodel comprehension, we introduce modeling features for the recreation, in fact, renarration of megamodels. Our approach relies on certain operators for extending, instantiating, and otherwise modifying megamodels. We illustrate the approach in the context of megamodeling for Object/XML mapping (also known as XML data binding). Lämmel, R, & Zaytsev, V. (2013). Language Support for Megamodel Renarration. In J de Lara, D Di Ruscio, & A Pierantonio (Eds. 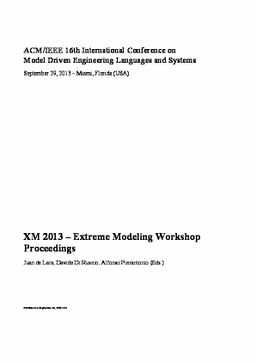 ), Proceedings of Extreme Modeling Workshop 2013 (XM 0) (pp. 36–45).